Home > News > News > Mom Gets in Free – Sunday, May 12! Mom Gets in Free – Sunday, May 12! What’s better than being with Mom on Mother’s Day? Enjoying AMT’s newest Original Show Broadway: Now & Forever with her on Sunday, May 12, AND getting her ticket for FREE! 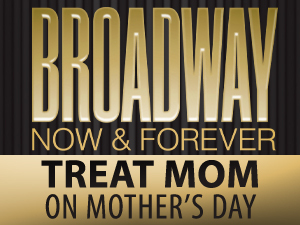 That’s right … Bring Mom to see Broadway: Now & Forever at 3:00 p.m. on Mother’s Day, May 12, and she gets in free with the purchase of one regularly priced adult ticket. Stop by the box office or call 800-648-4102 and mention code MOM to order your tickets – Mom will love you for it! Offer valid for May 12, 2013 show only, with the purchase of one regularly priced adult ticket. Valid for new orders only; cannot be combined with other offers. Must mention code at time of purchase. Sorry, this offer is not available online.